Pioneers in the industry, we offer programmable paper cutting machine, hydraulic paper cutting machine, semi automatic paper cutting machine, fully automatic paper cutting machines (with worm gear), paper cutting machine and fully automatic paper cutting machine from India. 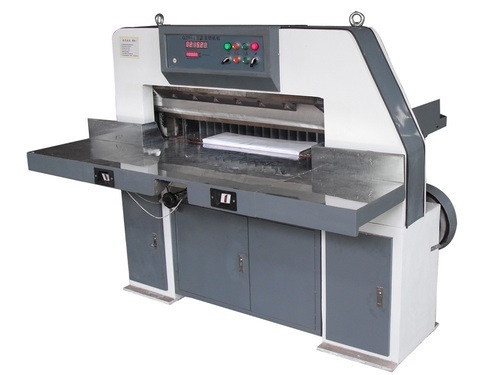 In order to fulfill the diverse needs of our clients, we are manufacturing and supplying a qualitative array of Programmable Paper Cutting Machine. Power Reqd. 2+1+1½ H.P. 3+1+1½ H.P. 3+1+1½ H.P. Gross Weight 1600kgs. 1800kgs. 2000kgs. 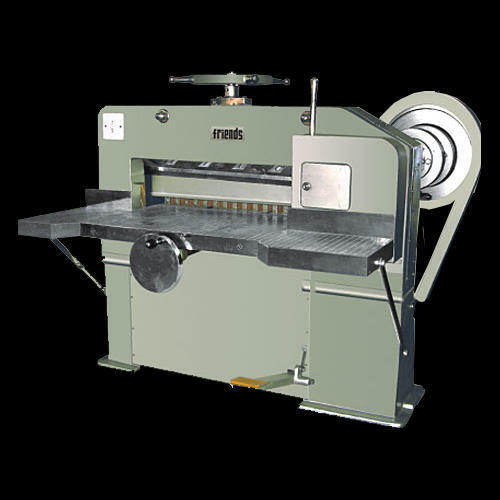 The High Speed Friends Make 115 EMC ,Cutting Machine is specifically Designed to cut board, Plastics, Aluminum, PVC Film, Wood Veneers, Asbestos board, Emery Cloth, Rubber and Leather as well as other Sheet Material that is to be cut with precision and speed. The Friends Makes 115 EMC, High Speed Cutting Machine is a high performance machine designed specifically for the Paper Mills, Offset printers, Print shops, Book Binders , Copier paper industry & stationary industry. Clamp Pressure 450 kgs. 500 kgs. Electric Loading Min 5 H.P. 7 H.P. 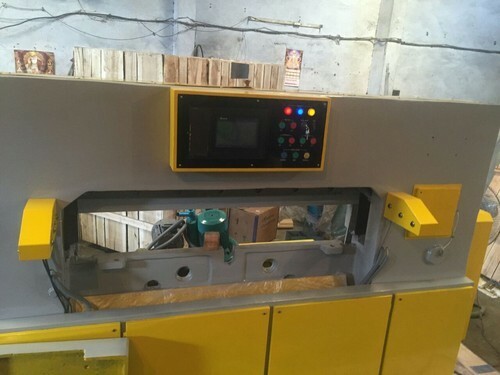 Friends Engineering Company offers a very Specialsed Model of SemiAutomatic Paper Cutting Machine, please go through the under mentioned Strong Points for more information. Friction clutch system for maximum efficiency and minimum maintenance. Rapid type hand clamp and Foot Clamp for smooth and easy operation Easy replacement of knife. Fine adjustment of knife height by eccentric levers. Adjustable back gauge for accurate parallelism with knife edge. Device provided with locking arrangement to avoid shift in the position of back gauge during operation. Safety and saving of space. Centralised lubrication of moving parts. Power Required 2 H.P. 3 H.P. 3 H.P. Gross Weight 1600 Kgs. 1800 Kgs. 2000 Kgs. 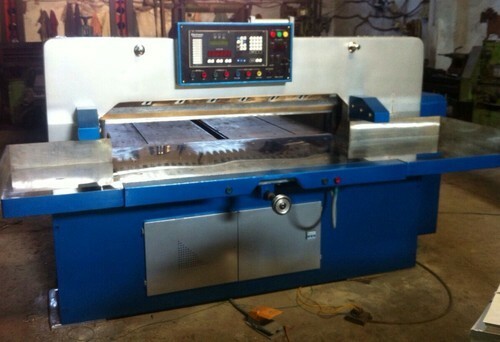 We are involved in offering a wide range of Paper Cutting Machines to our most valued clients. 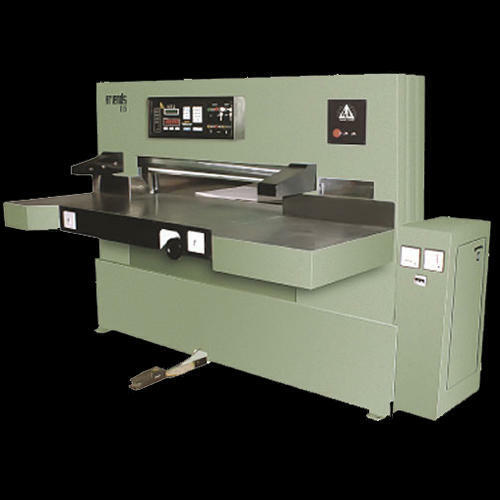 Our range of Paper Cutting Machines are widely appreciated by our clients which are situated all round the nation. Machine with Electromagnetic Clutch and Brake System , heavy duty spring clamping system , Photo cell for hand safety of operator , auto-Measure back gauge system , Lubrication oil pump system , Extended side tables for easy paper handling and storage , Lighting provided on cutting line , Stain Steel Plate on front of the bed to avoid Rusting , Two ISI Electric Motors with machines.In the interest of product upgradation/improvement, the manufacturer reserves the right to change the specifications and features without notice. Machine Size33”(84cm)36” (91cm)43” (109cm)Length of Cut33”(84cm)36” (91cm)43” (109cm)Width of Cut33”(84cm)36” (91cm)43” (109cm)Pile Cut4"4.5"5"Cuts per Min302825Power Reqd.2+1+1½ H.P.3+1+1½ H.P.3+1+1½ H.P.Space Reqd.5.5'×5.5'×6'6.5'×6.5'×6'7'×7'×6'Gross Weight1600kgs.1800kgs.2000kgs. Machine with Electromagnetic Clutch and Brake System , heavy duty spring clamping system , Photo cell for hand safety of operator , auto-Measure back gauge system , Lubrication oil pump system , Extended side tables for easy paper handling and storage , Lighting provided on cutting line , Stain Steel Plate on front of the bed to avoid Rusting , Two ISI Electric Motors with machines. In the interest of product upgradation/improvement, the manufacturer reserves the right to change the specifications and features without notice. Power Required 3 H.P. 5 H.P. In order to fulfill the diverse needs of our clients, we are manufacturing and supplying a qualitative array of Guillotine Paper Cutting Machine. 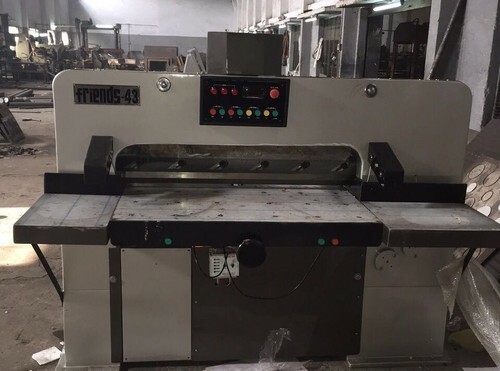 Looking for “Paper Cutting Machine”?